It’s fast approaching the time of year that most students dread: exam time. It’s normal to feel a bit of anxiety in the lead up to sitting exams and in small doses, it can help you to do better. When it becomes overwhelming, it can have the opposite effect and potentially stop you doing as well as you might otherwise have done. I’m seeing quite a few students for anxiety relating to this and I wanted to pass on some advice that can help teens who are currently struggling with exam anxiety. Sleep: Not getting enough sleep can make exam anxiety worse. Worries about studies, exams and not being able to get to sleep can create a vicious cycle that makes it even harder to sleep well. If poor sleep is an issue for teens with exam anxiety, this is something that can be addressed so that it doesn’t increase anxiety levels further. Nutrition: A healthy, nutritious diet can help with anxiety and some foods can even help to reduce anxiety symptoms. Eating more of these foods in the run up to exams can help to calm things down. On a similar note, avoiding foods and drinks that are more likely to increase anxiety is really important around exam time too. This includes caffeine, which stimulates the nervous system. Hydration: Even a little bit of dehydration can mean that you’re not functioning as well as you could be and this can be crucial during study sessions. Don’t wait until you’re thirsty to start drinking – this is usually a sign that you’re already starting to get dehydrated. Try to drink regularly throughout the day to keep hydrated, even if you don’t necessarily feel that thirsty. Sugar intake: Limiting sugar intake can help with exam anxiety. Sugar is known to cause insulin spikes, which can trigger anxiety symptoms. You’ll get an energy boost and ‘high’ after eating or drinking something sugary but it’ll be followed by a crash as blood sugar levels dip. This can leave you feeling tired and lacking in energy and motivation to study. Fluctuations in blood sugar levels can also trigger the release of cortisol and adrenaline, two stress hormones that bring on anxiety symptoms. Taking regular breaks: Longer study sessions aren’t always more productive ones. Studying for long periods of time without a break can be a bad move and studies have indicated that cramming doesn’t help you to remember information any better. I always stress the importance of taking regular breaks away from studying to recharge the mind and help to retain information from your studies. Distractions: Another factor can be the amount of time that teens spend interacting with online friends and the distractions this can bring. This is one of the reasons why it’s so important for teens to have a structure and routine for managing their time and study sessions. Minimising negativity: Exam anxiety can be exaggerated by stress that isn’t directly related to exams or studies and this is an area that parents can help in. If you make a regular effort to eat together as a family, dinnertime conversation can be a culprit if it sways towards topics that could cause added anxiety. An example of this that I’ve seen with teens has involved discussing issues affecting the family, which have had the effect of stressing them out on top of the anxiety they are already feeling. Organising rewards: Arranging fun activities and rewards that give your teen a much needed break from their studies can be another way to ease their anxiety. It can also help you to bond as a family. Helping with structures: If you teen is struggling with putting together and sticking to a routine for revision, helping them to do this can make a lot of difference for reducing exam related anxiety. Hypnotherapy can help teens to think differently about themselves and the exams they will be taking. A key part of this is the ability to not get drawn into “what if?” scenarios that can create more anxiety, and encourage procrastination and avoiding revision and studying altogether. Hypnotherapy can teach tools and techniques to clear a racing mind so that you can go into an exam with a calm and positive manner. If you feel relaxed and confident in your abilities and preparation, you’re much more likely to be successful in reality. Once you’re in the exam, you can use the tools to reduce your anxiety and overcome stress and pressure that could otherwise be overwhelming. Combined with lifestyle measures to help you to function at your best, hypnotherapy to help to reduce exam anxiety and get you ready to achieve your full potential. There’s no denying that smartphones and technology in general have made life a lot easier in some ways. It can also pave the way for stress, anxiety and insomnia. Research has suggested that the average person checks their smartphone up to 10,000 times per year – which works out at around 28 times per day. 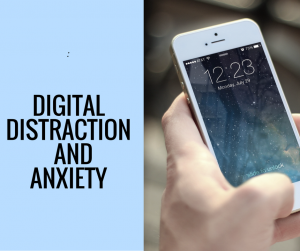 In this post I’m going to talk about the link between anxiety and digital distraction, and share some tips on how you can reduce your over reliance on technology. A study by Anxiety UK found that regularly using technology increased anxiety, especially with regards to social networking. The behaviour of many of the participants became more negative and involved comparing themselves unfavourably to other people and finding it hard to switch off and relax. And if they couldn’t get online to check emails or social media, almost half of the the respondents experienced a spike in their anxiety levels. 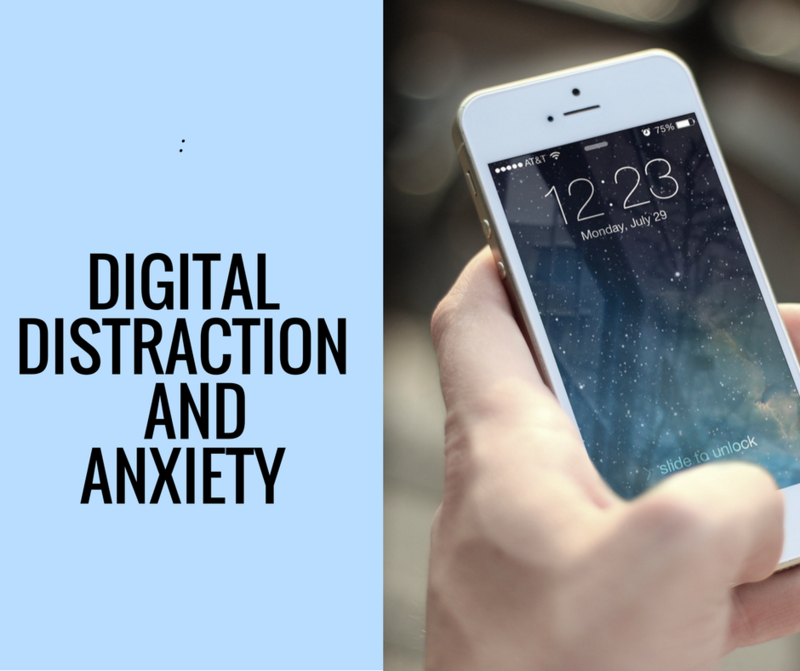 The study concluded that people who are prone to anxiety can find that technology acts as a catalyst that results in their anxiety becoming overwhelming. One of the reasons that technology can become addictive is the Fear of Missing Out (FOMO) when you’re not online. Another factor is why we find it so hard to step back from technology. Researchers have suggested that we get a surge in dopamine levels every time we get a notification. Dopamine is linked to rewards and even addiction, especially if we expect the message to give us pleasure. “Blue light” from technology is another issue associated with technology and is linked to sleep problems in particular. It reduces melatonin levels, which means it’s harder to get to sleep and stay asleep causing insomnia. Turn off notifications: Most of the time, you check your phone because it pinged. If you set notifications to silent, you might still feel obliged to check “just in case”, especially to begin with but this is likely to happen less often because your attention isn’t being drawn to your phone whenever a notification sounds. Check in every so often: If you can’t shut yourself off from your devices altogether to begin with, wean yourself off them bit by bit instead. Set an alarm to go off every 15 minutes and give yourself an opportunity to check in online for a brief minute or two each time it goes off. The idea is that you can gradually get used to going longer between check ins until you feel able to go up to an hour or two. Filter your emails: One of the biggest causes of digital distraction is the number of emails that come through in the average day and the compulsion to check them as soon as a notification pings. Setting up your emails to filter only the most important emails directly to you and arranging for the rest to go into folders to be viewed later can significantly reduce the amount of notifications you receive. You can then set time aside to view the less important emails rather than feeling compelled to look at them there and then. Limit “blue light”: With “blue light” being a problem for sleep, you don’t want to have too many devices in your bedroom or be active on them at the wrong time. Switching off devices at least an hour before bedtime limits the amount of “blue light” that you’re exposed to just before you go to bed. “Blue light” can affect the quality of your sleep, which can increase anxiety and encourage low mood – especially if you’re prone to worrying and negative thoughts. If you’re not currently affected by anxiety, insomnia can make you more likely to develop it. Try a digital detox: A short term digital detox can have a lot of benefits for your emotional wellbeing, including helping you to concentrate better, sleep better and be less stressed. Doing this for too long may not be that realistic if you need to stay connected for work but if you can do a digital detox for even 24 hours, it can help your mind to switch off. Even a couple of hours of digital detoxing on a regular basis can be great for your mental health. If this advice doesn’t help to reduce digital distraction, hypnotherapy could help. Hypnotherapy has a great success rate in treating stress and anxiety and can also help to break the habit of checking devices all the time. It can help you to get to the bottom of why you check your devices so much and provide tools and solutions to deal with the trigger(s) in different ways. You may not be consciously aware of what is behind it but emotions can often play a bigger role than you think. Take the first step towards reducing technology-related stress and anxiety by contacting me on 07915 093588 or send me a message on the Contact Form. If you’re caught up in a cycle of negative thinking, it’s all too easy to feel that you have no choice but to let your thoughts continue to dominate you. What if you could find a way to let go of negative thoughts and break the hold that they have over you? This can be a genuine reality if you can retrain your brain to change how you think and feel, and it’s not as difficult as you might think. Change the way you think by contacting me on 07915 093588 or send me a message on the Contact Form. How Soon Will I Feel Improvement in my Anxiety? Negative thinking is essentially a habit and like all habits, it can take a while to fully break the control it has. Think of it like a muscle: building it up doesn’t happen overnight but over time, it leads to better emotional strength and resilience. For most people change happens very quickly with hypnotherapy but it can take between 6-12 sessions to ensure the good habits become second nature. I’m going to talk about retraining your mind to think positively, rather than negatively, and give you some tips on how it works. Negative thinking often involves judging, criticising and doubting yourself at every turn. These thoughts can pop into your mind completely out of the blue and their effects can be truly confidence zapping and soul destroying. Catastrophising: Always predicting and expecting the worst case scenario to happen. Personalising: Assuming that you are the reason that something negative has happened and blaming yourself for it. This can often be for things that have happened in the past. Filtering: Seeing the downside(s) of situations and glossing over the positives. We all experience negative thinking sometimes and in itself, it’s not a big issue. The problems begin when we believe our negative thoughts and automatically accept them as fact. Not taking a step back from them and questioning whether they have any basis means negative thoughts can act as instant triggers for the fight-or-flight stress response. It fools your brain into believing that there is an immediate threat that needs to be dealt with and the physical symptoms of the fight-or-flight response quickly kick in. Some aspects of negative thinking are based on things that are happening in the present but your worries can quickly move from here to the future. This can lead to anxiety about ‘what if?’ scenarios affecting your health, finances, relationships and other parts of your life. At its worst, this can result in chronic, debilitating anxiety and panic attacks. It’s not hard to see how negative thoughts can completely dominate your mind, to the point that they crowd out everything else, and affect your physical health. Retraining your mind is one of the best ways to control negative thoughts and the anxiety they create. Encouraging your brain to think more positively can feel overwhelming, especially if negative thoughts and beliefs have been part of your life for a long time. Your thoughts do not define you: Your thoughts and your mind in general are just a part of who you are. Negative thoughts aren’t true in many cases and don’t validate ‘truths’ about yourself – no matter how real they may feel. Being able to separate yourself from your thoughts means they won’t have the same power and control as before. Be aware of how you think: Negative thinking can become second nature and you may not even realise how much it is happening. Becoming really conscious of your thoughts is the first step to being able to change things, allowing you to be aware of every negative thought that comes into your mind. Paying this level of attention to them brings a sense of mindfulness and helps you to take a vital step back. This starts to reduce a lot of the power that negative thoughts hold over you. And eventually, the power disappears altogether. Don’t fight your thoughts: When you become aware of a negative thought, trying to fight against it gives it more power in your mind. Acknowledging it briefly (as a thought rather than a fact) and then letting it ‘float’ away without giving yourself the opportunity to believe it takes away this power and allows you to regain some control over your thoughts. Positive imagery can help here. Imagining that you can literally see your negative thoughts floating off into the distance can be very liberating. One key thing here: trying to judge, ignore or change a negative thought helps it to retain its power. Visualise yourself being more positive: When you are caught up in a cycle of negative thinking, it can be almost impossible to see yourself being a positive person in the future but this is where visualisation and positive imagery techniques can really come into their own. This can be a powerful tool for encouraging change, which is one of the big reasons why it’s used in hypnotherapy. Keep a positivity/gratitude diary: Before you go to bed, think about 3 things that have been good about the day or that you feel grateful for. This is one of things I ask my clients to do in between our sessions as it’s a great way to focus your mind on being more positive. Over time, it can help to retrain your brain to move away from negative thinking onto more positive ground. Hypnotherapy can help: Hypnotherapy is a very effective intervention for anxiety and stress. One of the big plus points of hypnotherapy is the ability to access the subconscious mind, which is where habits and patterns of behaviour are formed, including negative thinking. Because it works at a subconscious level, it can be successful in changing habits and behaviours, even when other approaches fall short. Some of the tools that can do this include positive suggestions and imagery. Negative thinking can be a difficult habit to break and if you’re feeling overwhelmed by it at the moment, don’t despair! It’s not an overnight process but it is definitely possible to retrain your mind to think more positively. Lots of my clients have been able to do this very successfully through hypnotherapy. Call now to book a consultation!